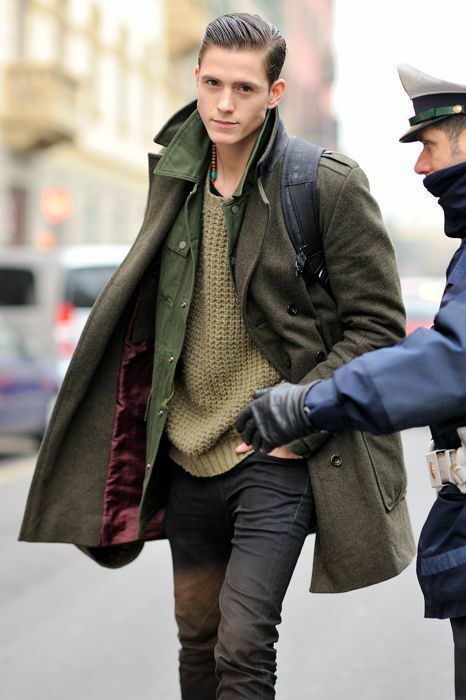 Many winter coats in men’s fashion have its roots in the military. 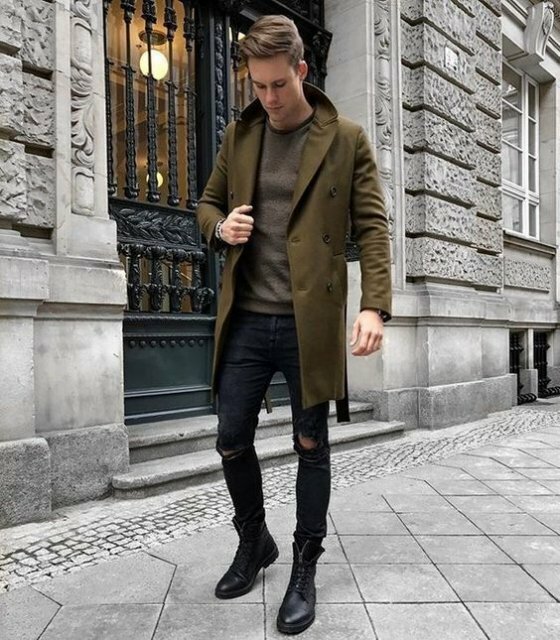 The bomber jacket and aviator jacket were first popularized by European Air Forces during the late 1950s and in 1963, and then the trench coats were designed for the British and French soldiers in the First World War. 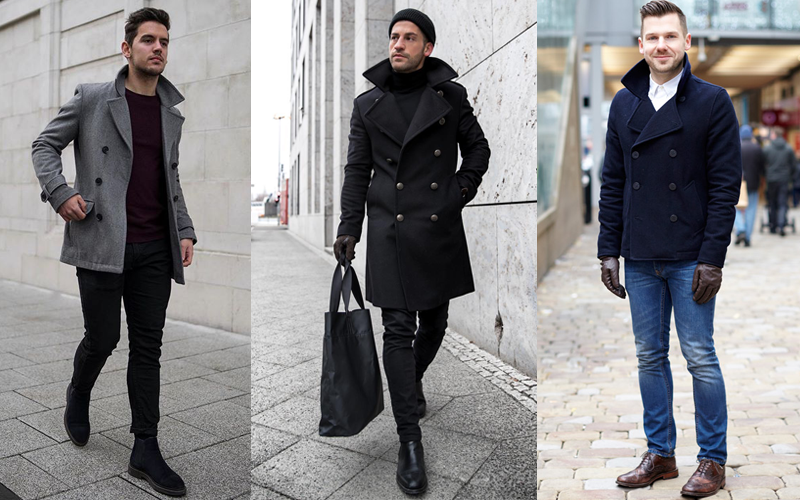 Undoubtedly, many garments began their lives as part of military uniforms, as well as the next winter coat that we’re going to introduce – the Navy Peacoat. 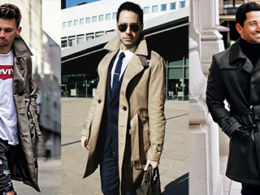 RELATED: How to wear a trench coat? 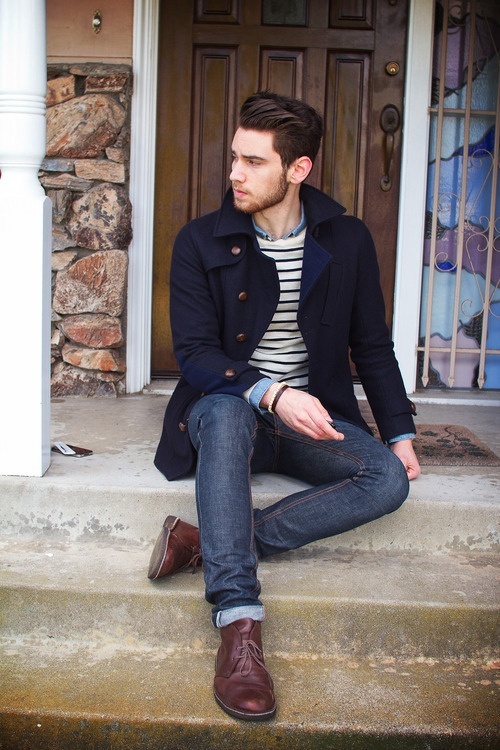 With its first appearance during the 18th century, the peacoat has helped the sailors to keep warm in the harsh cold conditions of the ocean for more than two centuries. 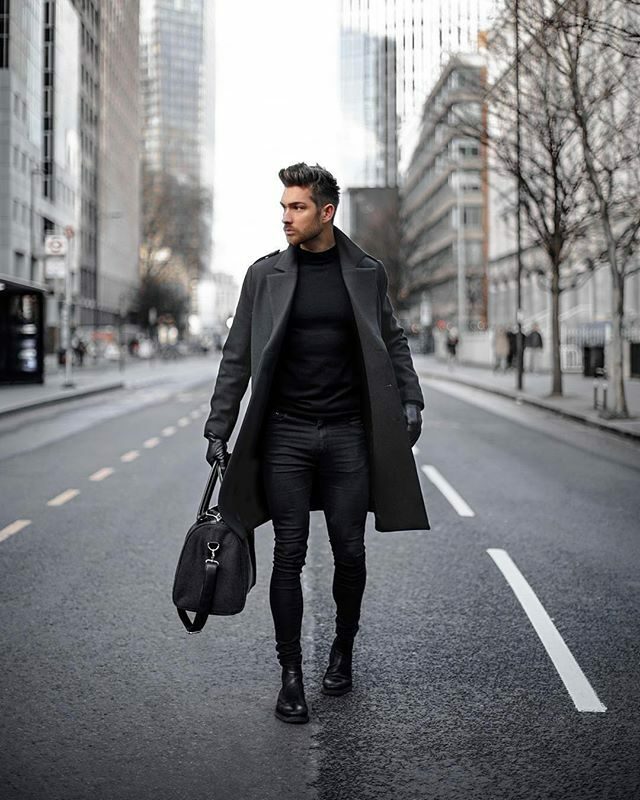 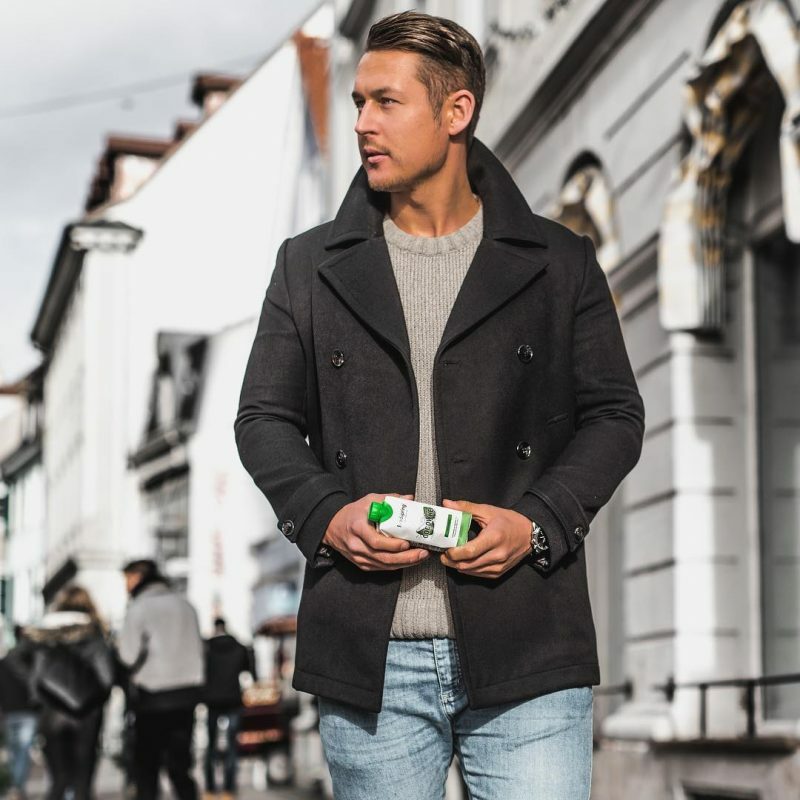 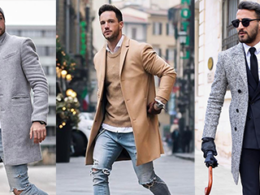 Today, the double-breasted, the cropped style which features large notch lapels and bigger buttons on the front jacket has become a beloved staple of autumn and winter in most men’s wardrobe. 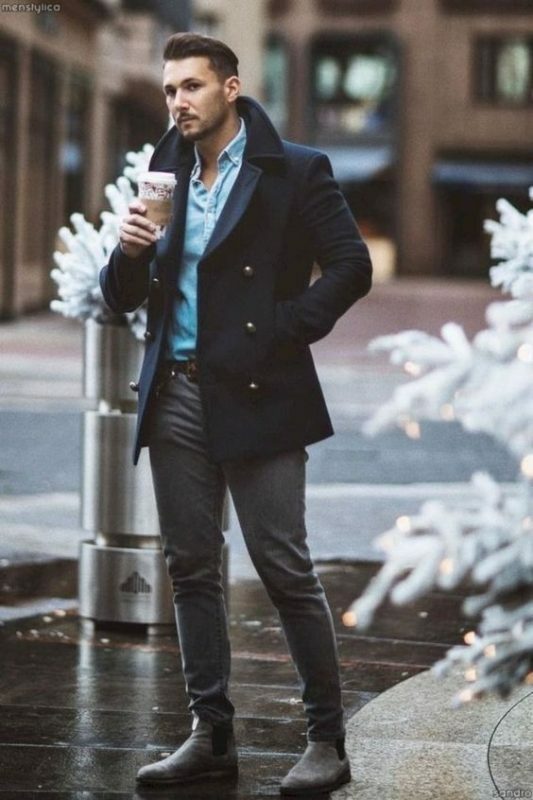 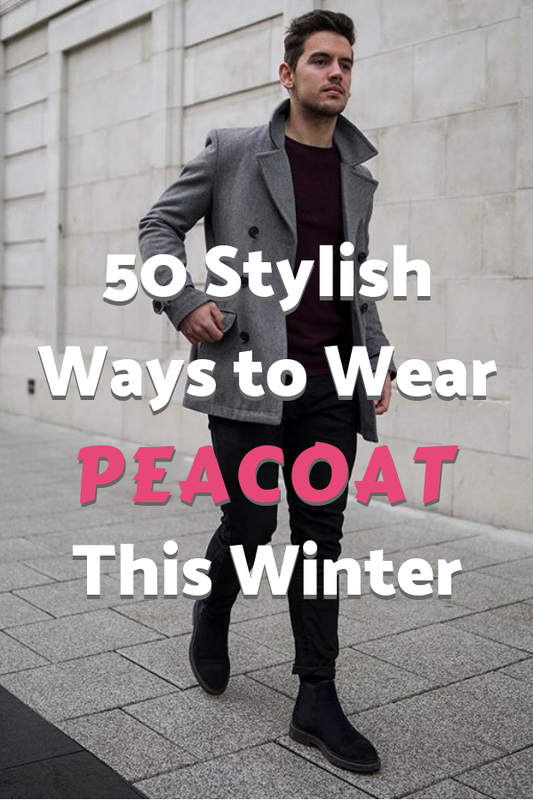 How to Wear a Peacoat? 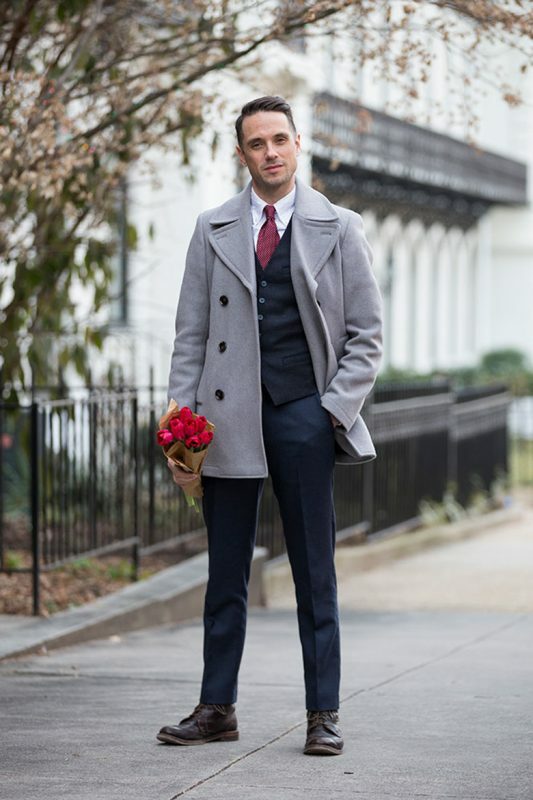 When you are wearing a suit outside, regardless of the climate, you should always wear an overcoat because this is the only coat that amplifies the suit. 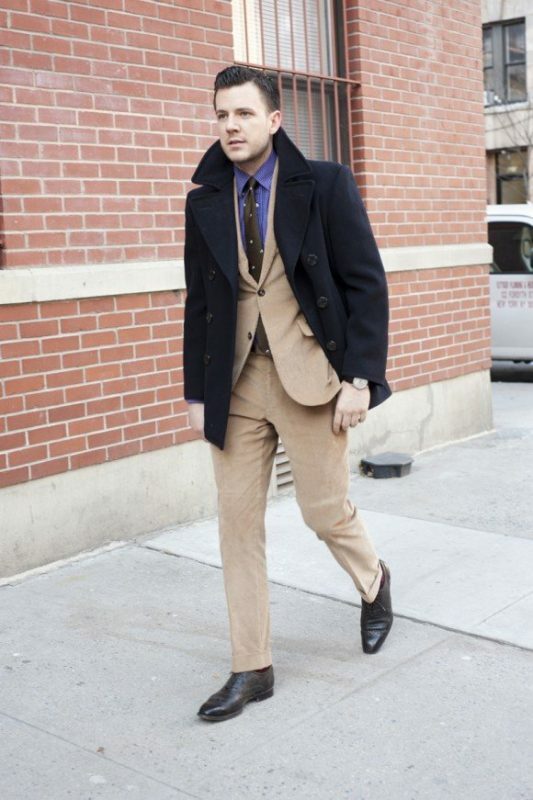 Few fashion experts would advise us not to wear a peacoat over a suit, but this statement was just half true. 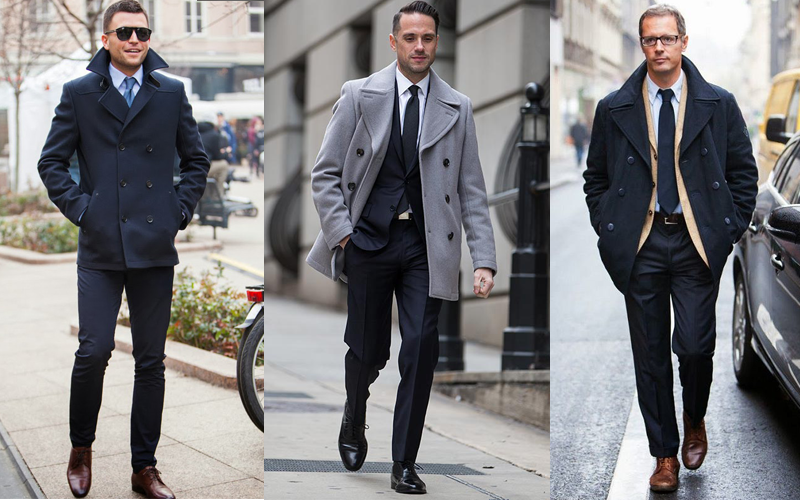 Always opt for a peacoat which has longer in length than the suit blazer, the same rules applied to the trench coat. 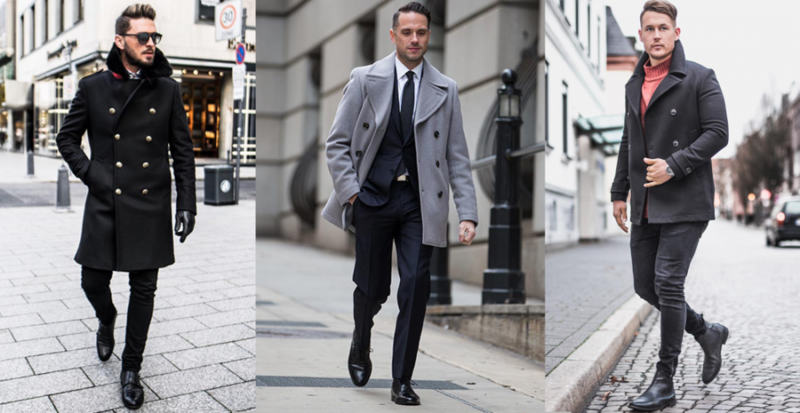 Another masculine, stylish style is leave the suit jacket inside the wardrobe. 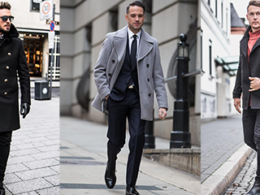 Create a more sophisticated work look with only a white shirt and a printed or dotted tie. 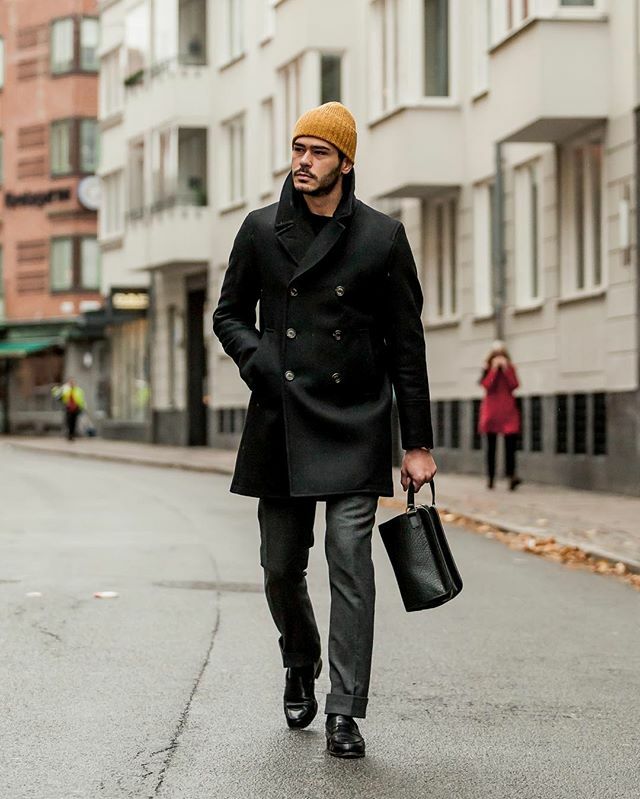 Pair it with dark coloured suit pants and a pair of black or brown leather Oxford shoes then your winter workwear look is nailed. 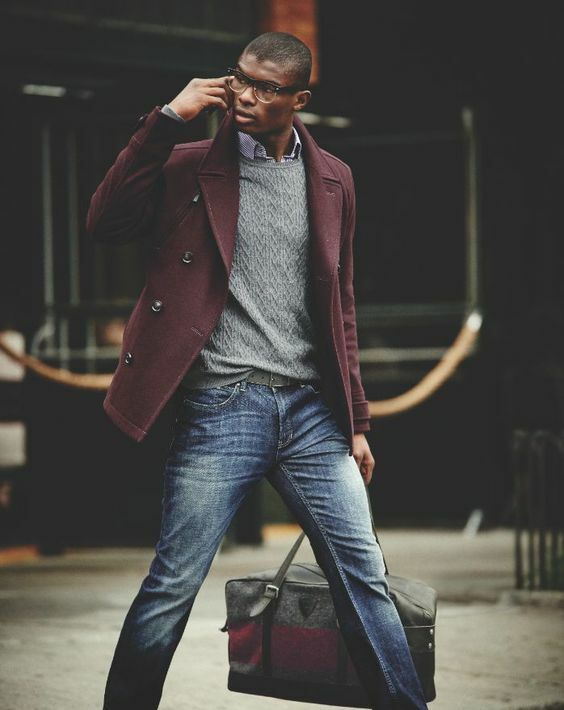 The casual style has no limitation. 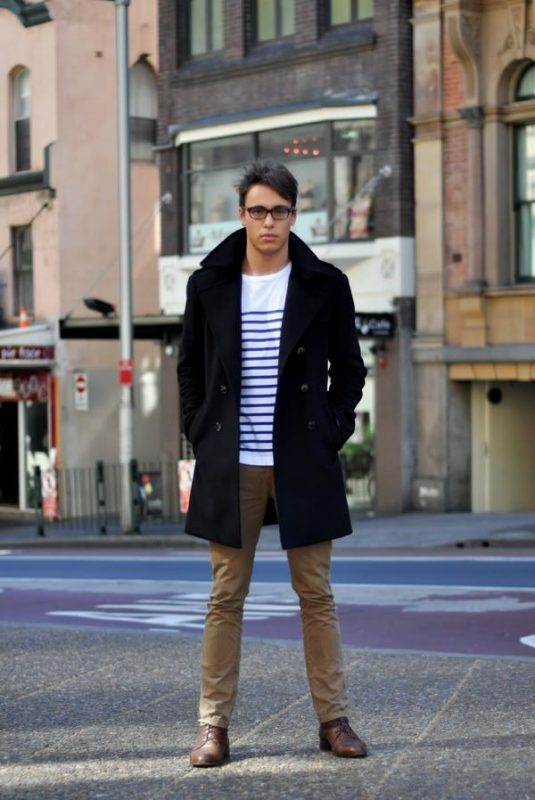 You are free to add different layers underneath the peacoat to inject a bit of personality and creativity to your style. 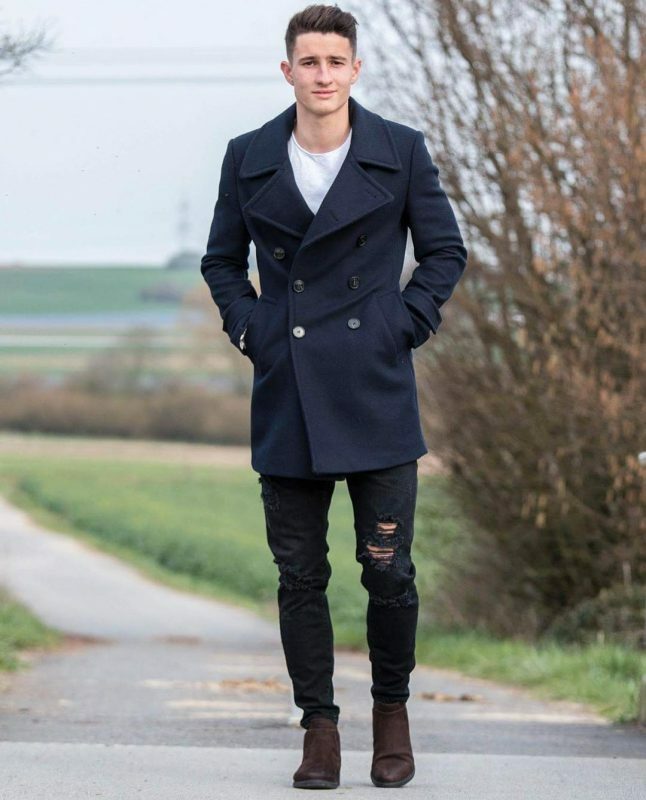 Navy peacoat is the most classic piece for a casual day and it works practically well with blue jeans and chinos in various colors. 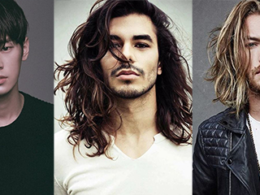 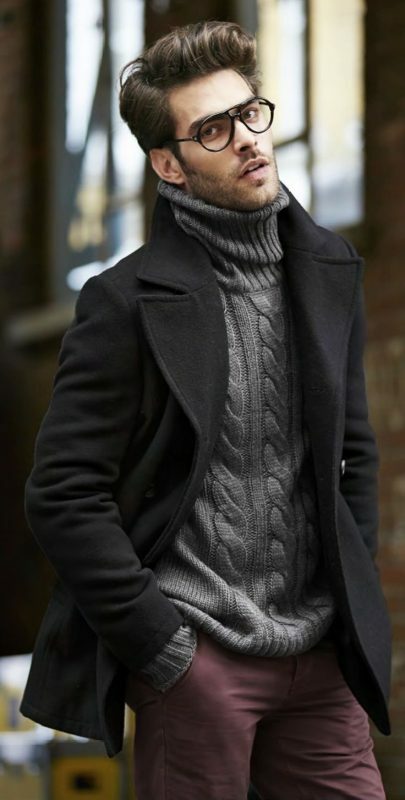 Turtleneck, denim overshirt or cable knit sweaters are great underneath to create a cool laid-back style. 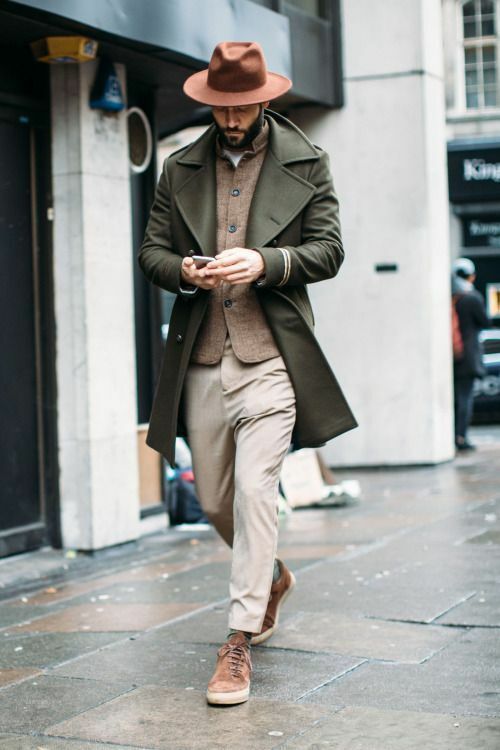 Finish the outfit with a scarf for a more dapper look, but try to create a knot that will tuck into your collar. 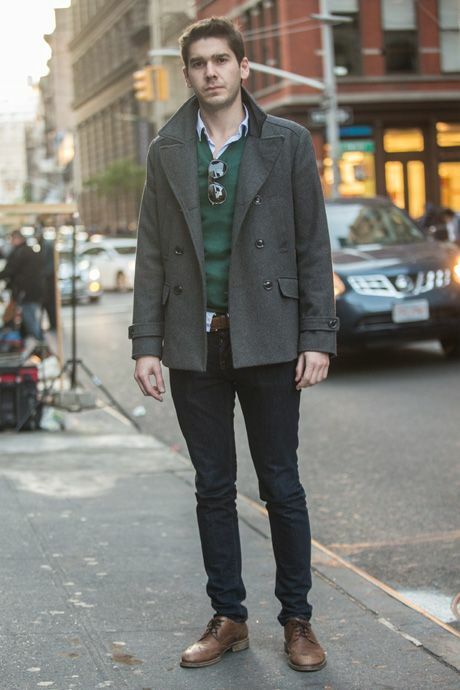 A hat or a beanie is optional. 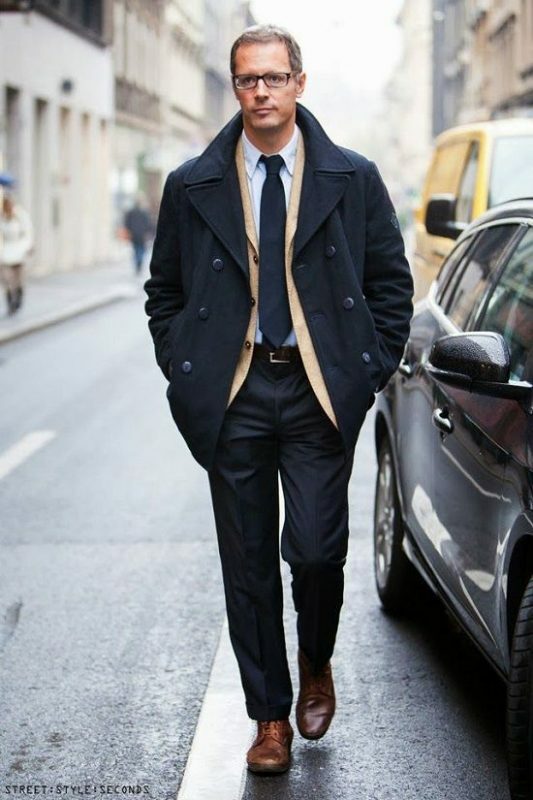 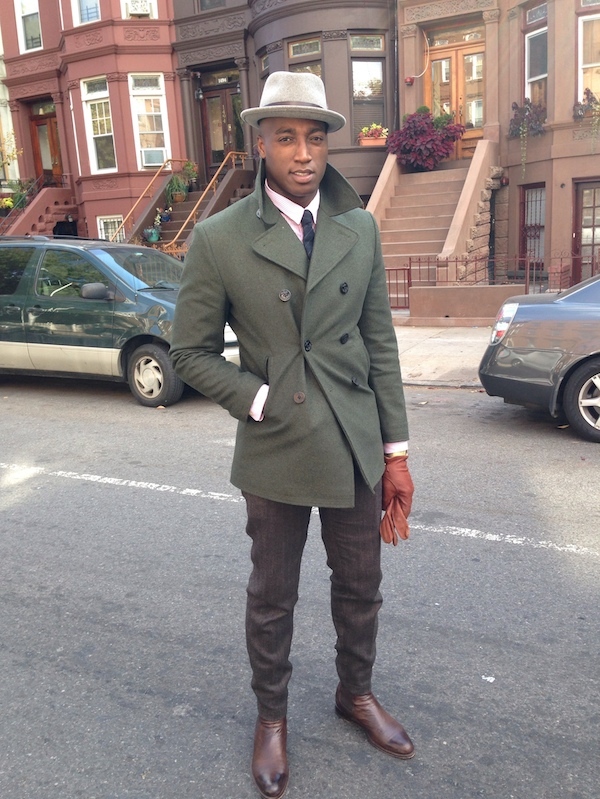 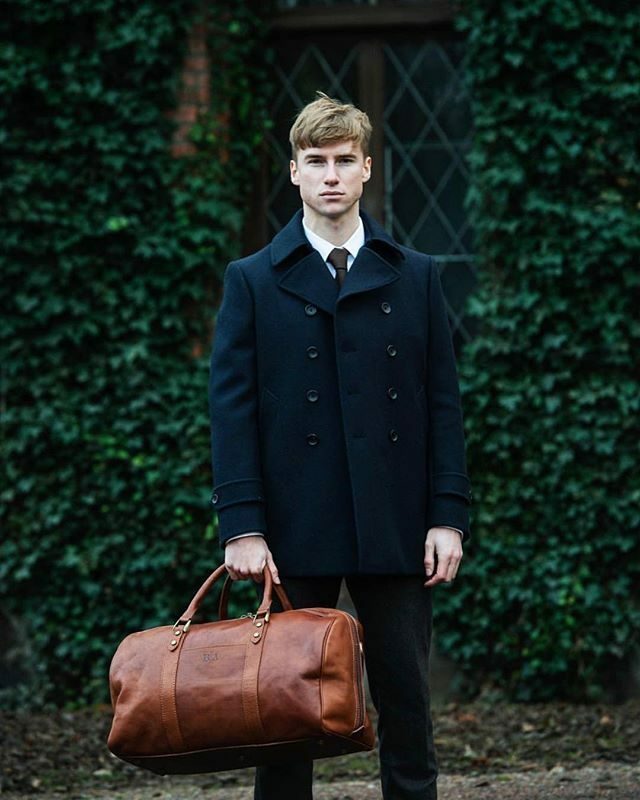 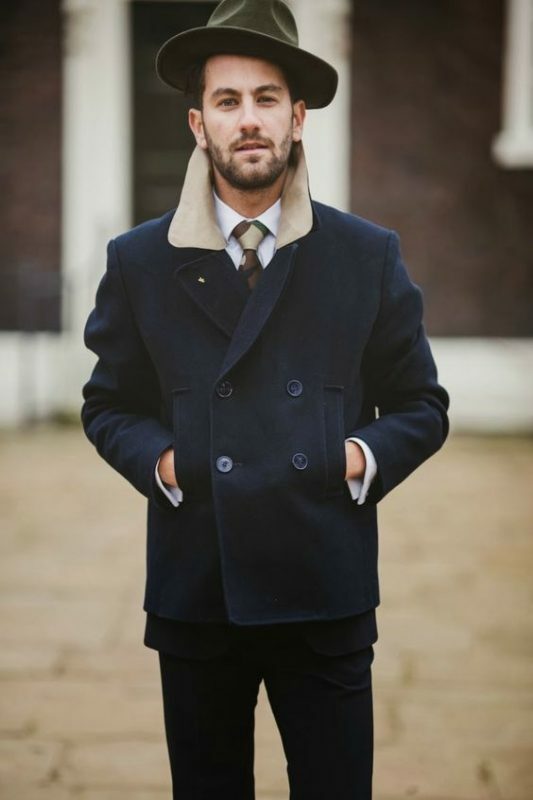 There is a reason why the peacoat has large collar and notch lapels. 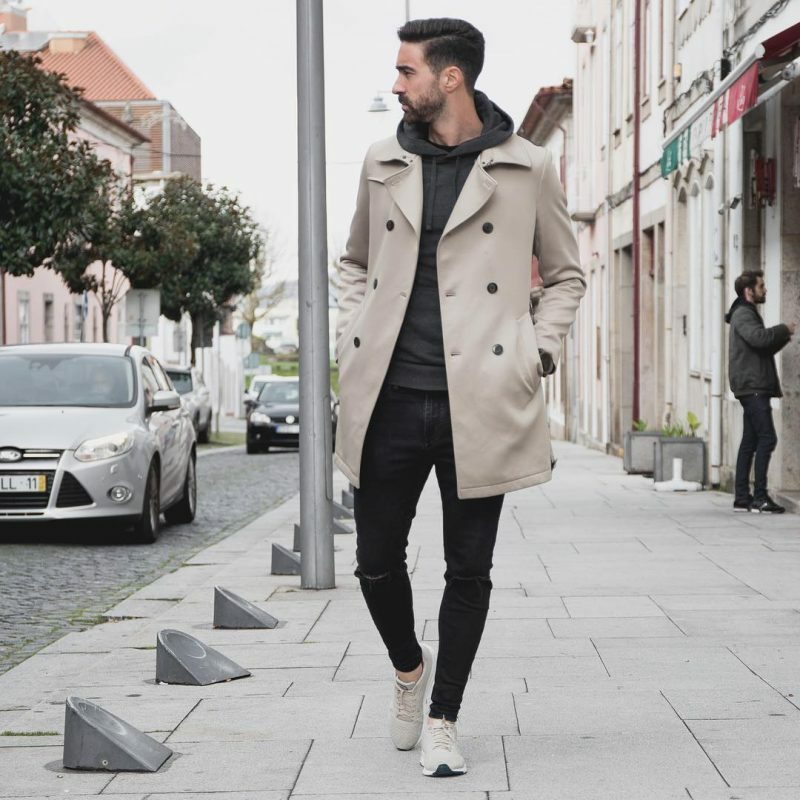 By popping the collar, it is not just creating another cool style but also serves as the windbreaker to give you a bit of extra warmth and protection from the elements. 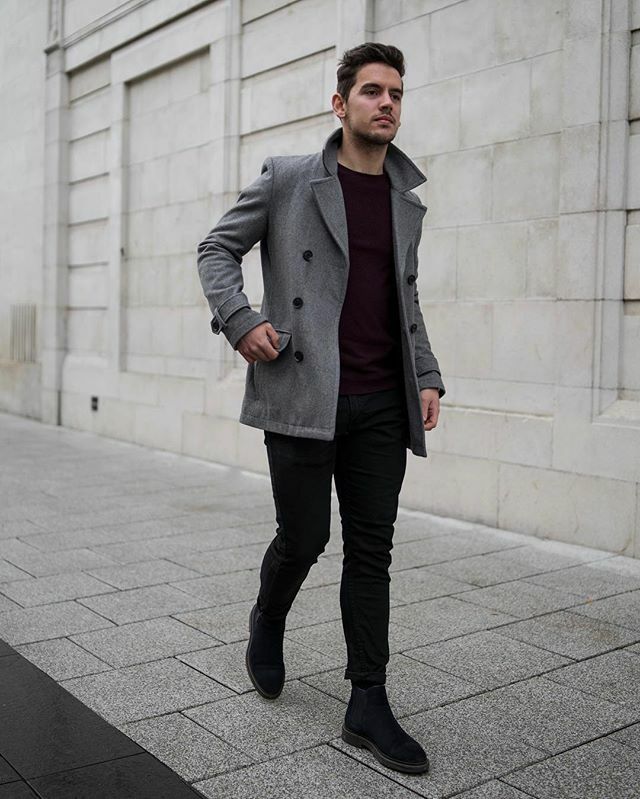 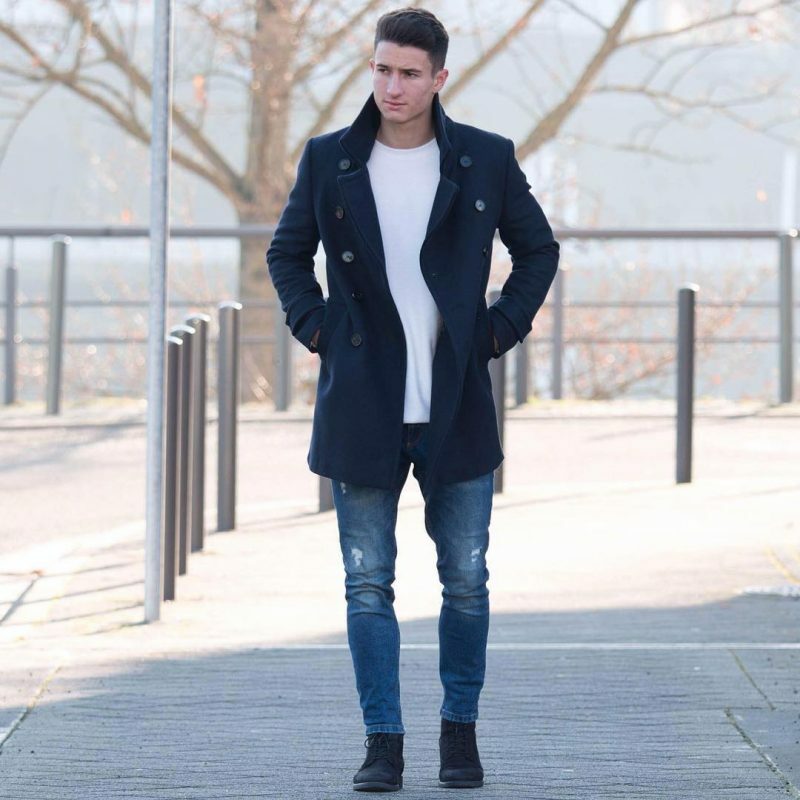 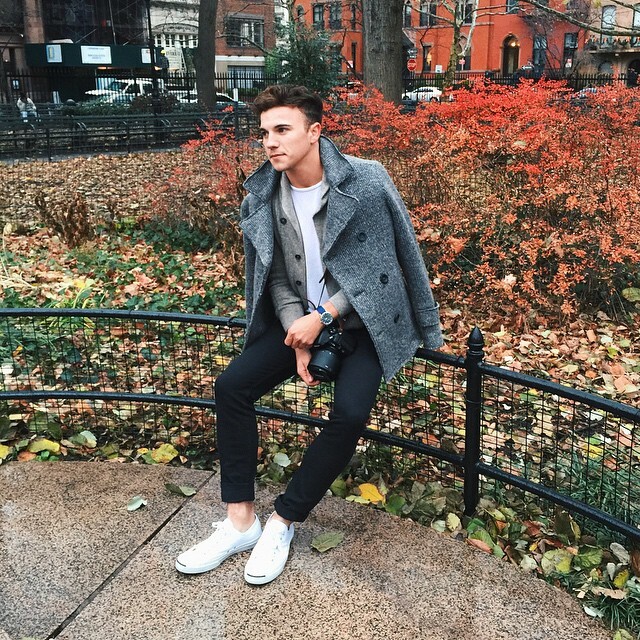 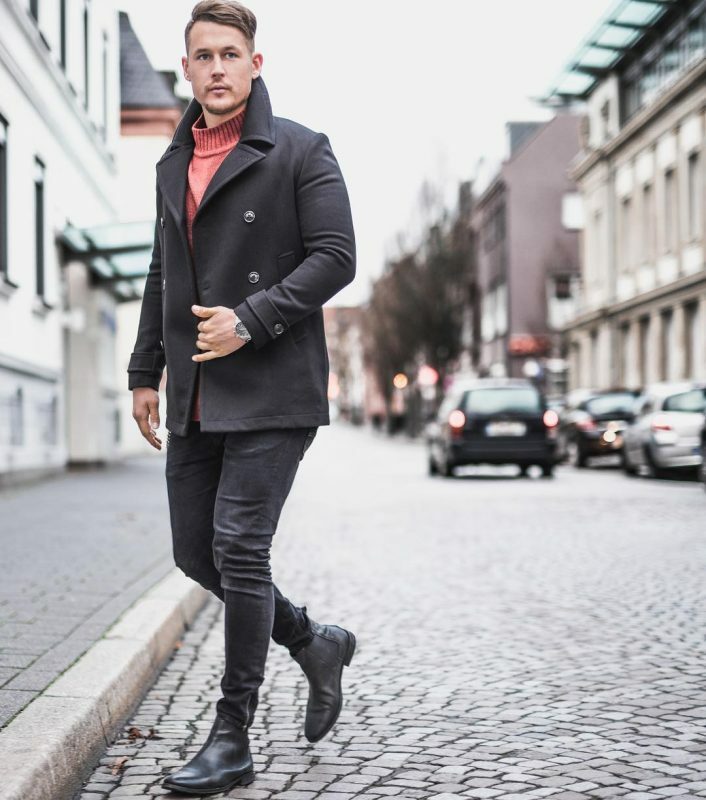 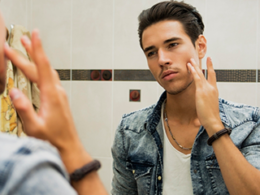 If you want to sharpen up a casual look for a Saturday night out, pair your popped collar peacoat with a grey sweater, a blue jeans and a pair of sneaker or trainer. 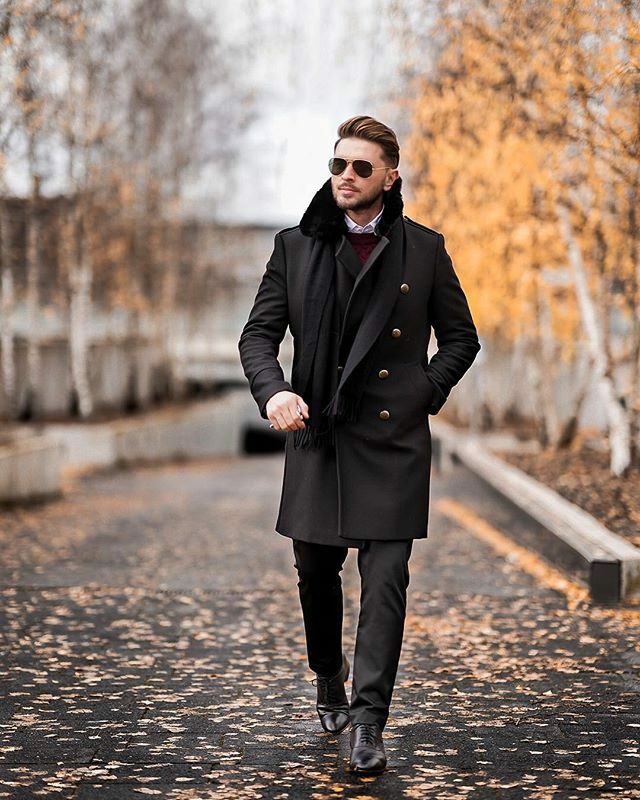 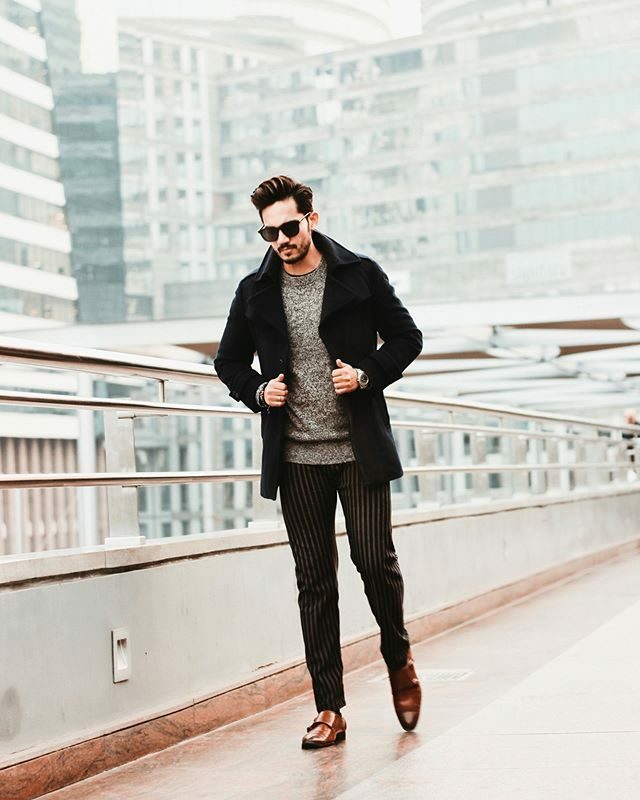 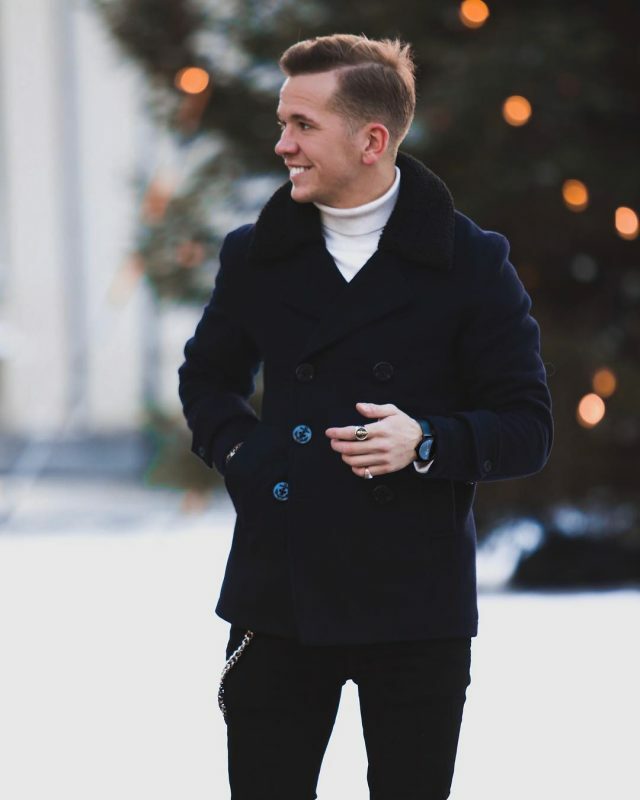 Make sure that the peacoat comes with a stiff, or slightly exaggerated collar, otherwise, the collar won’t able withstand under the windy weather. 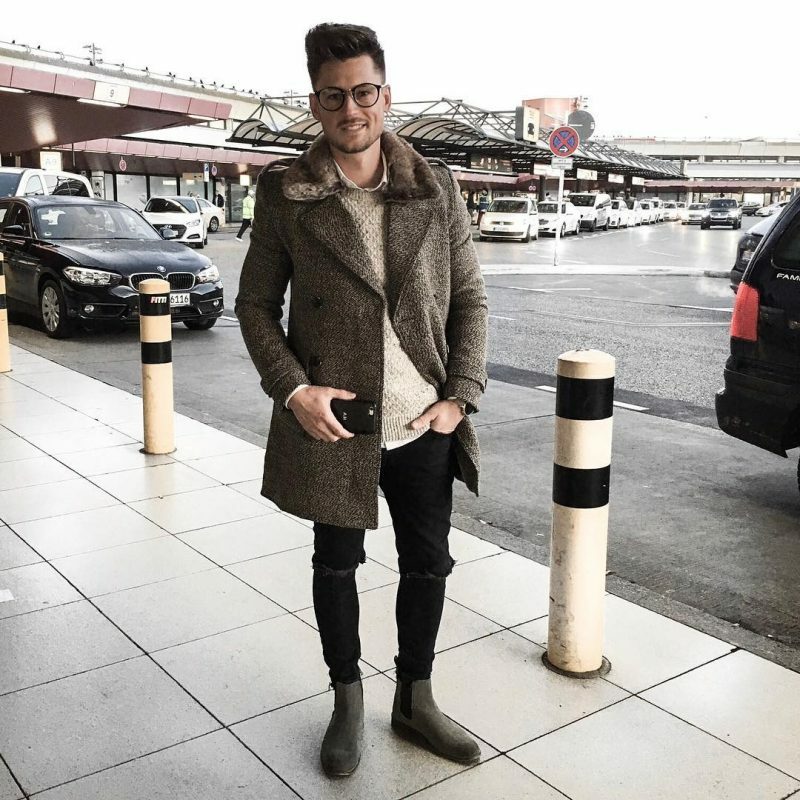 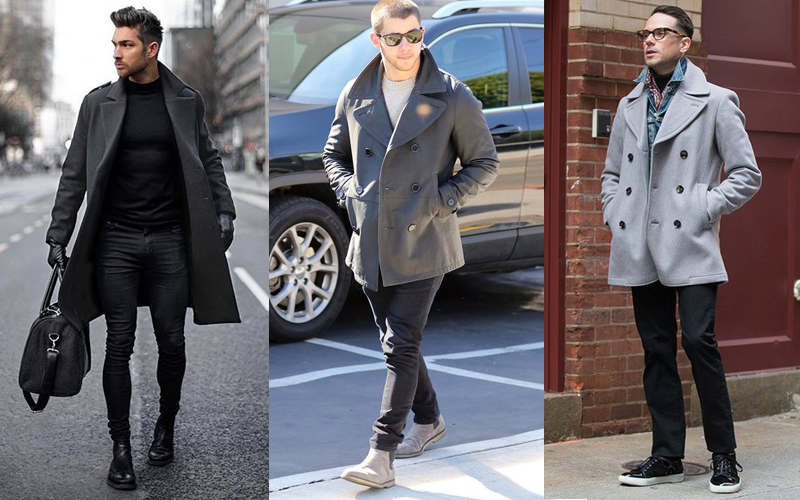 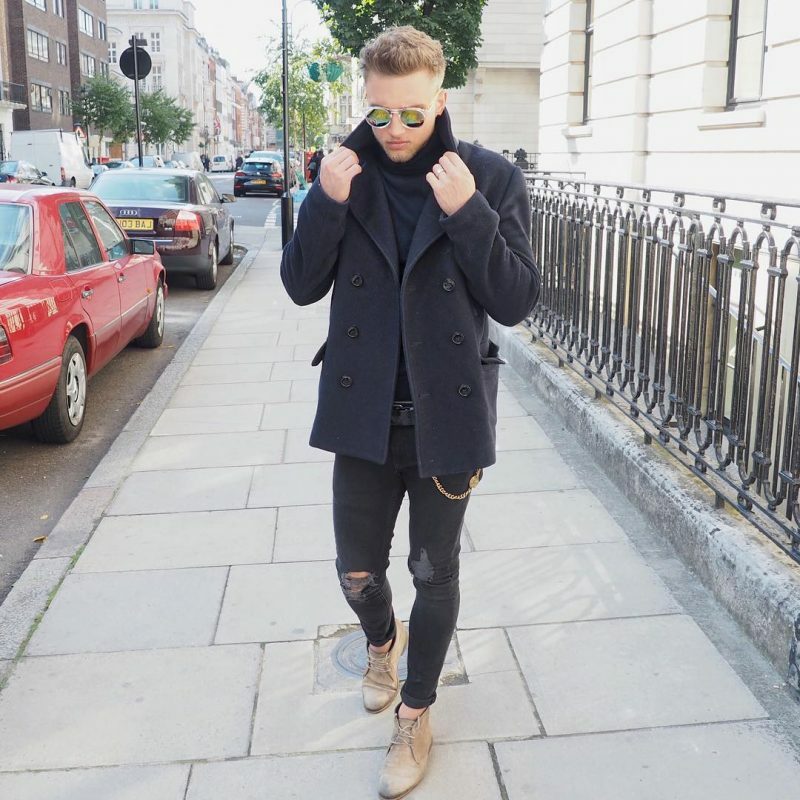 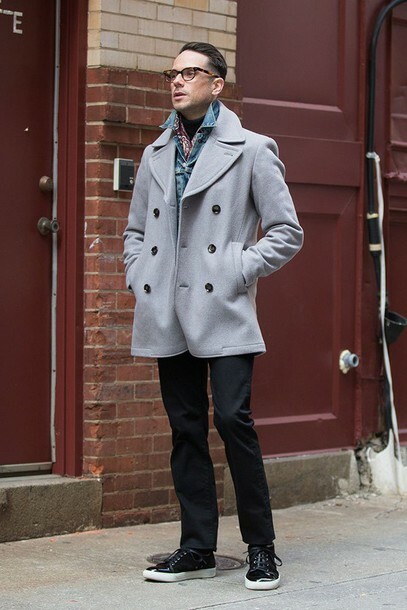 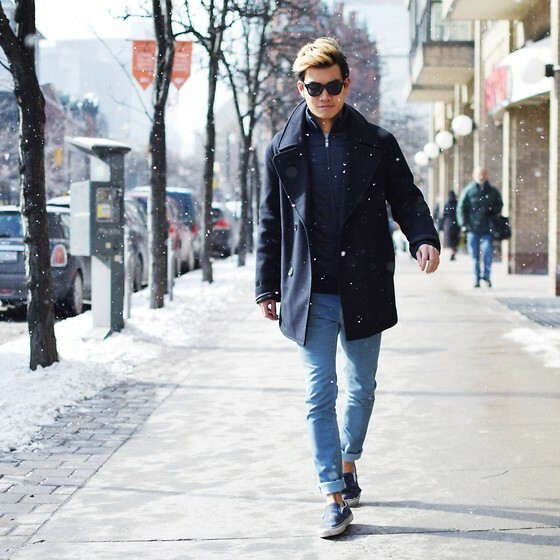 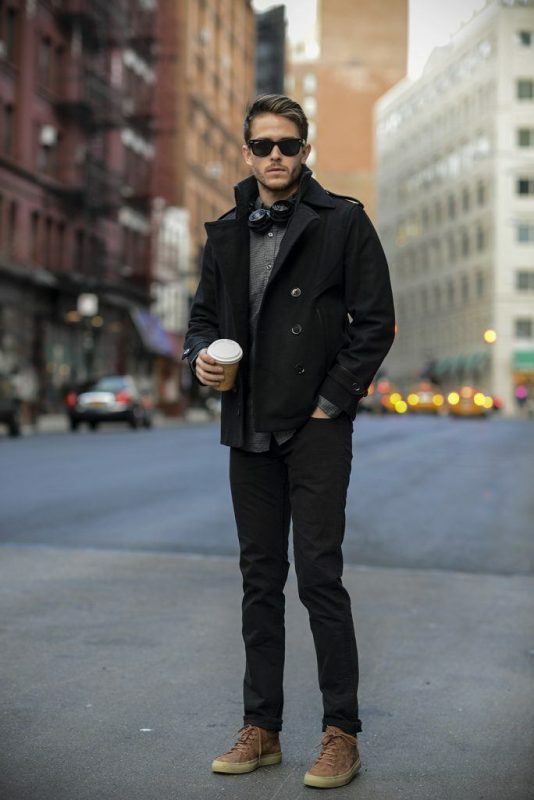 We’ve curated 50 pictures to demonstrate how to wear a peacoat for this winter. 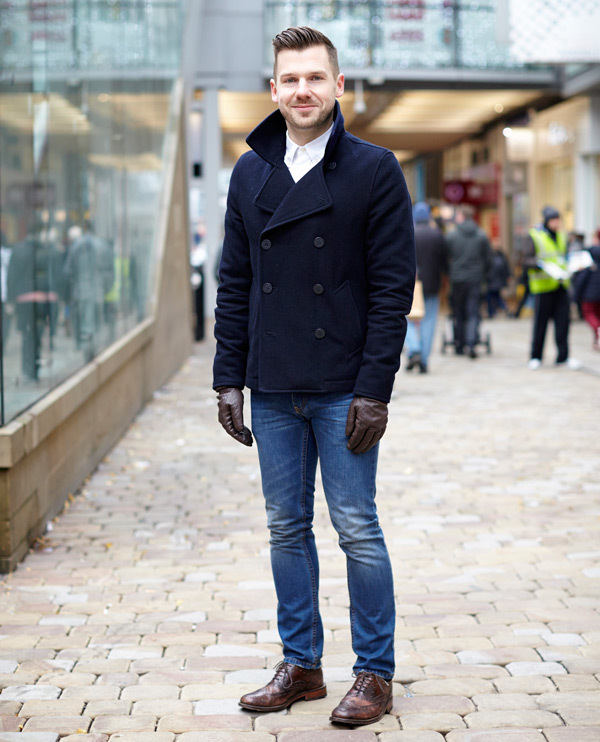 Please click next button or slide left using your finger if you’re on mobile.